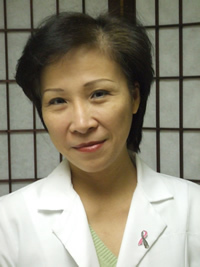 Lily Wang Pugliese is a New Jersey and New York state licensed acupuncturist. She is NCCAOM (National Certification Commission for Acupuncture and Oriental Medicine) board certified in acupuncture, herbology, and oriental medicine. Lily is a graduate of Pacific College of Oriental Medicine in New York City where she earned master degrees in Traditional Oriental Medicine and Acupuncture. She also holds a Bachelor of Science degree in Nursing and a Bachelor of Arts degree in Biology from Hunter College City University of New York. Lily is a licensed registered nurse in New Jersey and New York and practiced nursing for close to ten years at New York University Medical Center's Cardiovascular Unit (open heart surgery) and at the Radiation Oncology Unit. As a professional healthcare provider, Lily has administered care to thousands of patients, many of them critically ill. She has seen the devastation caused by cancer and coronary disease. She has developed a deep compassion for, and understanding of, her patients and brings these same qualities to her acupuncture practice. Lily was born and raised in Taiwan. She is fluent in Mandarin Chinese, Taiwanese, and English.